Tonight — without fanfare — the new downtown street lights were turned on. Just as importantly, the old cobra-style highway lights were shut off. 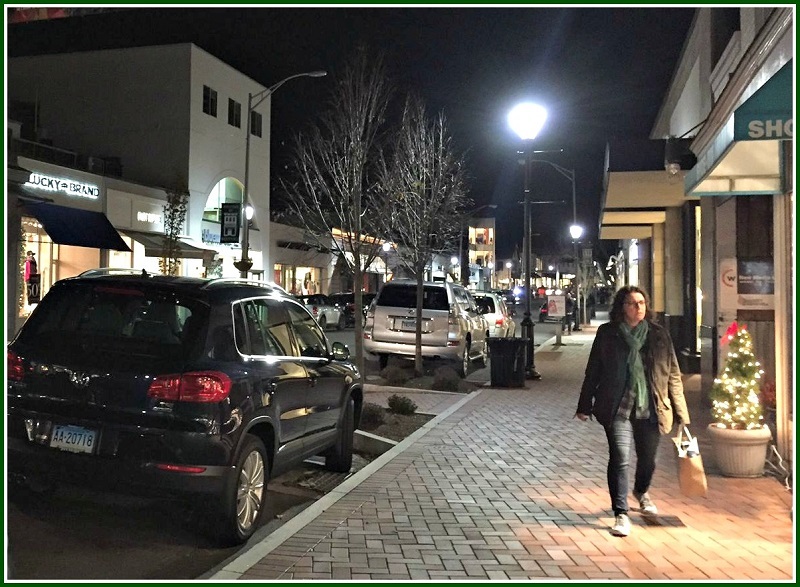 The new lamps — lower, warmer, nicer — are far kinder to Main Street. They also complement the lighting displays in many nearby stores. …and the east. Note the new, user-friendly pedestrian crossing in front of Banana Republic too. Soon, the holiday decorations will be up. They will be far lovelier than last year’s sad zip-line effort. Now all that’s left is for Eversource to remove the old lights. Let’s hope they move more quickly than the contractors on the Merritt Parkway North Avenue bridge. 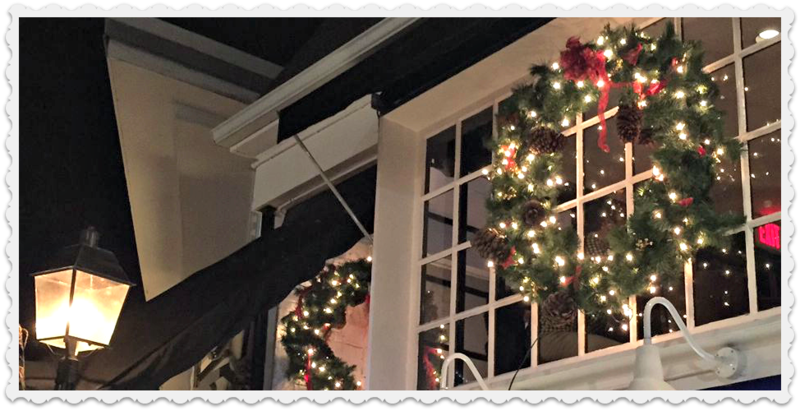 …while Tavern on Main boasts its traditional lamp, and a gorgeous wreath. 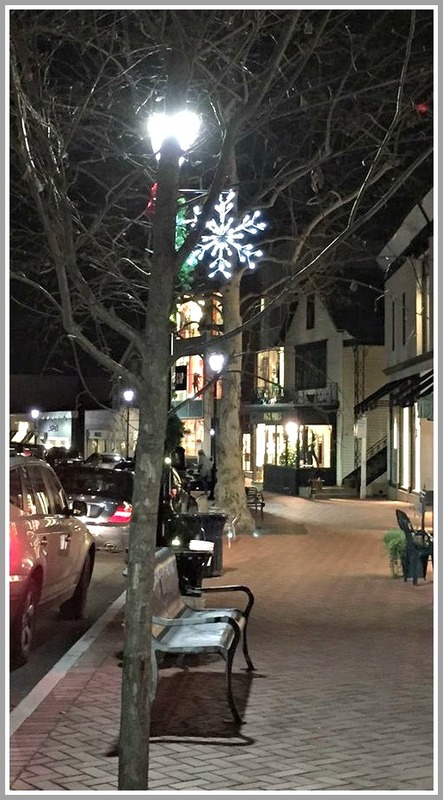 This entry was posted in Downtown, Local business, Restaurants and tagged Christmas lights, Main Street, Oscar's Delicatessen, Tavern on Main. Bookmark the permalink. I think it looks nice already! Let’s hope it only gets better as more decorations go up. Dan=Latest Fairfield=Westport MINITEMAN set me to wondering: Did Fairfield & Westport each lose their own editions ? Please advise. No idea. I don’t read either one. The old Chez Pierre (sorry, old school here), has the coziest set-up thus far. 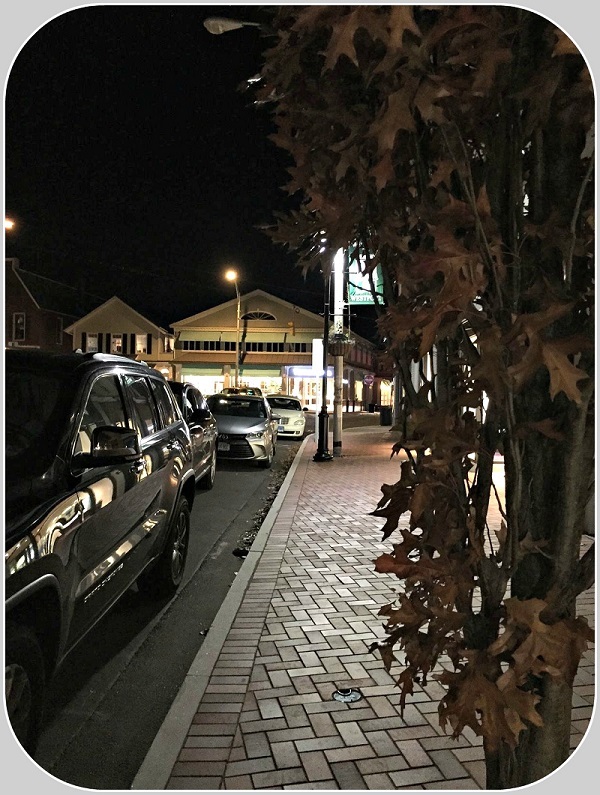 All the rest of Main Street has that “cold” glow of (IMO) autopsy-room “energy efficient LED” lights. Hoping for a better technology soon for a more soothing lighting that, of course, fits into our global need to be green. ‘Cause frankly, I’ll take oil lanterns over what has become the latest and greatest of effervescent lighting. (Well, sort of … Oil lanterns are more of a Charles Dickens sentiment than anything else, but still … my point is for adressing aesthetics vs. Blade Runner tech). Dan, I really enjoyed viewing your photos here, and I’ve shared them with some of my ex-Westport family. So, my buzz-kill-thoughts regarding lighting in general is not meant to impede on your creativity!! Thanks!! Sharon is right. White LED lights have an unnerving “Pottersville” quality. Coloured ones seem warmer, more “Bedford Falls”. At least, they’re safer than oil lanterns, or candles, or those original, hot, electric tree lights we grew up with (and caused a neighbour’s house fire)! So, yes, I wish there was a happy medium. Cheers! Oh yes Nancy, I sooo remember those super-hot “Charlie Brown” Christmas light bulbs! Couldn’t touch them by accident on a tree. Had to place them “just so”, away from direct branch contact (which was almost impossible anyway). Amazing there weren’t more house fires back then. My husband just installed those white LED bulbs at our garage lights. (We are trying to be “greener” whenever possible). But, when I come home at night, it feels like a post-apocalyptic waste land, in a dim glow of violet haze. Ugh, hate it, LOL! (I know, first world issues). So funny! We just replaced a kitchen ceiling bulb with a LED and, ugh!, it sure stands out from the rest! Oh well. I wonder if world leaders at the Climate Change conference do the same? I’ll ask my buddy Justin.